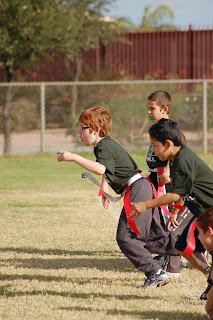 You can see Colin ready to leap off the line during a recent football game. They lucked out again with an awesome coach, who is supportive yet challenging at the same time. You often read about horrible parents and mean coaches -- but in the 5 years we've been involved in sports in this area, we've run into none of that. Baseball, Football and Soccer have all been great experiences that have allowed my boys to stretch their skills and learn more about individual sports and teamwork. Parents are encouraging and quick to cheer any good play, regardless of the team. Local high school coaches always come out for the clinics and bring along some of their players to help the younger kids improve their skills. They have only kind words for the kids, and tell them how much they look forward to seeing them play for the high school teams in a few years. Seeing the attitude of the high school coaches, I imagine we'll continue seeing good sportsmanship throughout the years. If you would have asked me 6 years ago if I saw myself spending 3 days/week, 8 months/year on a sports field, I would have laughed! Now? I cant wait to suit up Lydia and watch her play, too! Did you play Wordless Wednesday? Then tell your story on Tell Me Thursday!